Experience the thrill of driving on gravel and the sensation of being in control while sideways. Or let one of our experienced tutors take you for the ride of your life - you choose! The art of driving a car on gravel is practised on a regular basis by Rally Drive N.Z. - and they have a fleet of cars to suit corporate days, driver training or those who want to become more competent behind the wheel. 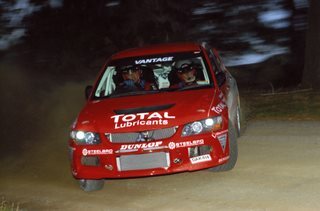 Rally Drive N.Z Limited was formed in 2000 by Hamilton businessman and rally enthusiast Dale Perry. Dale had previously been involved in rallying for 15 years as driver, co-driver and team manager. With the experience of running many international teams in the Rally of New Zealand, Dale saw the opportunity to expand his rally car lease business into a full rally driver training programme. The idea of developing a New Zealand rally school began to take shape and with the assistance of leading New Zealand Rally driver Marty Roestenburg, and experienced co-driver Colin Smith, Rally Drive N.Z. was born. Since its beginnings, Rally Drive N.Z has shared the experience of rally driving with people from around New Zealand and also overseas. With both the school and car leasing options Rally Drive N.Z provides the opportunity for people to experience the thrills of rallying in a hands on environment. Rally Drive N.Z has been successful in achieving its goal of providing the real rally experience to its customers. Yes there is a recession but that does not have to stop you considering that things must keep moving up. Copyright © 2019. Rally Drive NZ Ltd. All rights reserved.